One of the reasons this blog has been sans posts for a month is this project. I was commissioned to produce technical illustrations for an informational book about organic debris management. This essentially deals with the various ways landowners can manage their land to promote soil health and manage fire risk. 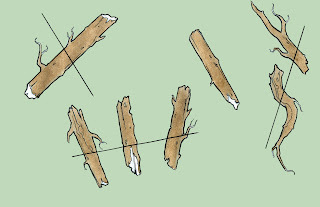 The first set of images is a figure showing the spatial relationship between logs on the ground level.